TM ONE, the business solutions arm of Telekom Malaysia Berhad (TM) has announced their commitment in collaborating with the fintech sector in a closed-door session they hosted in collaboration with MDEC held recently at DOJO KL. This announcement follows the hints that was made during their BFSI open day that TM ONE is potentially looking at partnerships with fintech companies. 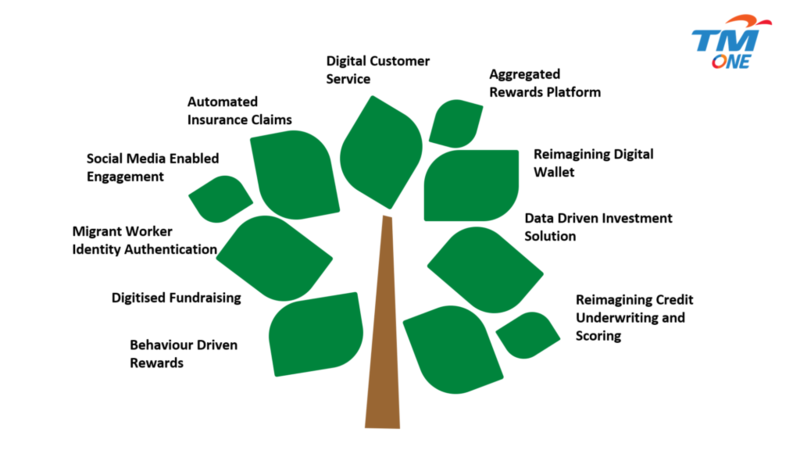 During the session, Carol Wang, General Manager, Banking, Financial Services and Insurance, TM ONE stated that they have identified 10 key fintech used cases under the Banking and Insurance vertical that TM ONE is keen on establishing partnership with, as illustrated below. She also pointed out that while they have identified these 10 core areas for the fintech companies to begin with, they are also open to look at other potential partnerships areas with the fintech companies to jointly address additional domains and specific customer needs. Mahmoud Dasser, Vice President for Marketing, TM ONE expressed that fintech companies can greatly benefit from TM ONE’s strong existing relationship with the banking and financial services as well as other vertical industries such as real estate, retail and logistics where fintech is changing the game. There are many reasons why Fintech should consider collaborating with TM ONE and join hands in bringing innovative and secure solutions to market at scale. As a digital enabler, TM ONE can provide a powerful access to market with its Customer Relationship Management (CRM), marketing and distribution capabilities, as well as many Fintech Infrastructure enablers such as Mobile Services, Data Centers, Cloud, Security and IoT services. He added that fintech companies are welcomed to jointly build customised innovative solutions or bundle their solutions along with TM ONE to deliver stronger offerings catering specifically to the financial institutions in Malaysia. Beyond that, he shared that as a digital enabler for various other verticals like smart cities, real estate and retail, fintech companies partnering with TM ONE can tap into their existing ecosystem to accelerate their solution into the market. An insurtech company offering micro-insurance can for example, tap into TM ONE’s Connected Home solution and provide contextualised insurance coverage to homeowners who are leaving for an overseas trip to purchase travel insurance and extra coverage for their homes. Another interesting use case that Mahmoud brought was that, TM ONE through their Connected Shopper solution, can partner up with rewards based platforms or digital wallets to push their promotions in shopping malls or even in major airports in Malaysia. The ability to reach end-users can sometimes be a challenge with the limited funding made available to fintech startups. So through partnership with TM ONE, they can obtain the right digital solution catering to their budget. In certain cases, where needed Mahmoud also expressed an openness towards setting up a strategic partnership along with a comprehensive due diligence process in place.